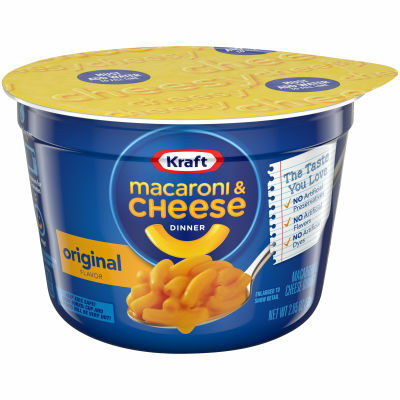 Kraft Easy Mac Macaroni and Cheese DinnerGet ready to drown into a mighty pool of cheese and cream with Kraft Easy Mac Macaroni and Cheese Dinner; prepared with original flavor with tantalizing cheese sauce helping you in losing your way in a cheese expedition. The spice of paprika gives a genuine hot texture to the macaroni and cheese dinner; crafted with care from USA for the people who are in love with macaroni. Once you start eating, you cannot resist the temptation and extravagant taste.Love at First Creamy BiteIt's rich in taste with velvety cream and lip-licking cheese to appease your undying cravings for a cheesy - creamy bite. The microwavable Easy Mac is easy to be carried along with you, wherever you go! Just go to a microwave, pour some water and watch the magic right in front of your eyes. The pleasing fragrance in the air will magnetize you on your seat until you gobble the cup. Serving size 1 Package (58 g).